A quiet island oasis in the middle of today’s dense, bustling city, Skeppsholmen, with its rocky, undesirable geography, was never densely developed. In the middle ages, the flatter southern edge of the island was probably cultivated or used for pasturage, but it is not until the 1500’s that we have a written historical record of the island. During this period, the island was known as Lustholmen, or “Pleasure Island,” because it was owned by the monarchy and was used as a royal recreation ground. We don’t know a lot about what type of recreation the island provided other than what we can deduce from a few surviving legal contracts with gardeners and with Wilhelm Boy, the architect of a non-extant gazebo on the island. Just north of Skeppsholmen and between it and the mainland is the former island of Blasieholmen. Blasieholmen is now connected to the mainland with filled-in land (dashed red outline on area map). Traditionally, Blasiehomen was a royal shipbuilding yard, and even the famous Vasa ship was constructed here in the 1620’s. 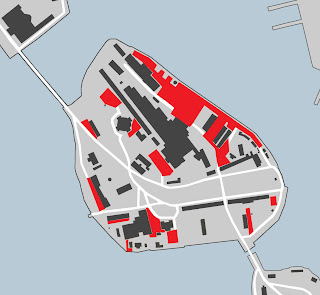 Blasieholmen is directly across the harbor from Tre Kroner, the royal castle (map 1). Queen Kristina grew tired of looking out on the disorderly shipyard and ordered it moved to the back side the island just to the south of Blasieholmen. 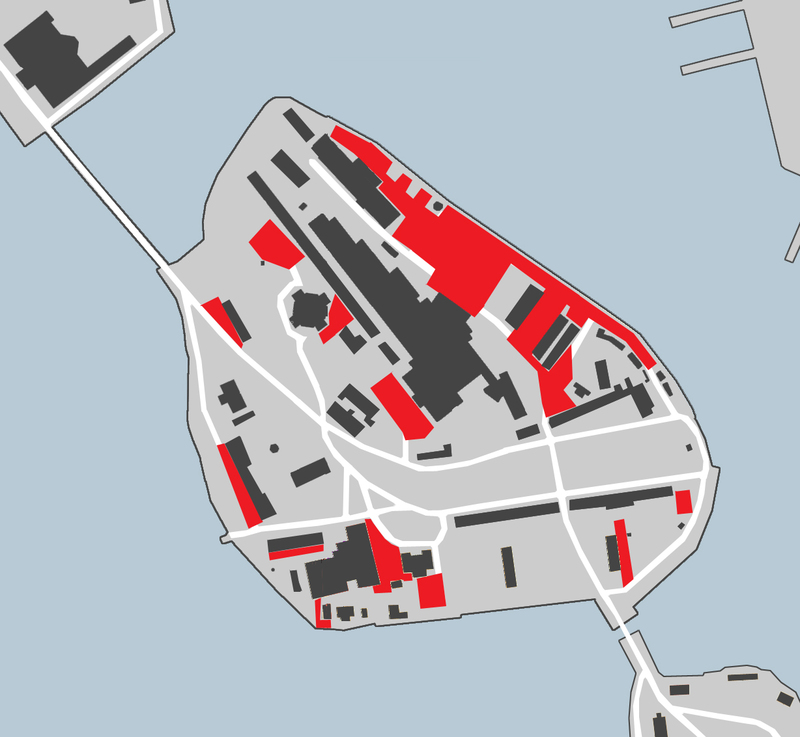 In its new location on Nya Skeppsholmen (New Ship’s Island), the shipyard was invisible to the castle (map 2). In time, the “New” was dropped from the island’s name. In 1634 when the shipyard moved to Skeppsholmen, the island officially became a naval base which was known as the Admiralty. With its new status as the Admiralty, the naval base needed more impressive buildings than simple ship-building work sheds. The first notable building on the island was the Amiralitetshuset, or Admiralty House, built in 1647 (map 3). It is a brick building with ornamented Dutch gables facing out on all four sides. The plaster, crenellation, and corner towers were added during a renovation in the 1750’s. The Amiralitetshuset has remained Skeppsholmen’s iconic landmark since the 17th century. 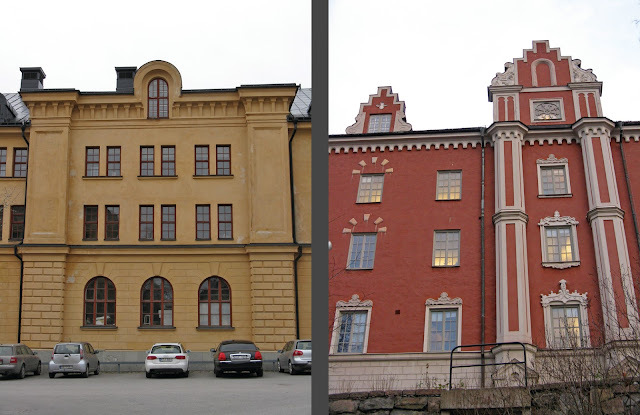 The photo on the left (taken from Gamla Stan) shows that the Dutch gables are purely facade; they are anchored to the roof with iron rods so that they don’t fly off in a strong wind. With the arrival of the Admiralty came a 200 meter long bridge connecting Skeppsholmen to Blasieholmen. The middle section was a drawbridge, and guards were housed on the island just beyond the end of the bridge. At the time, the length of the bridge was a notable feat of engineering. Buildings from the 1600’s that were related to ship making include sheds for drying, hewing, and working the timber; sail-making huts; a rope-twisting building; a windmill for grinding grain and pitch; a rope-drying house; oar-carving huts; a horse-powered mill drill; a cannon foundry; a cannon-loading crane; and an iron forge. 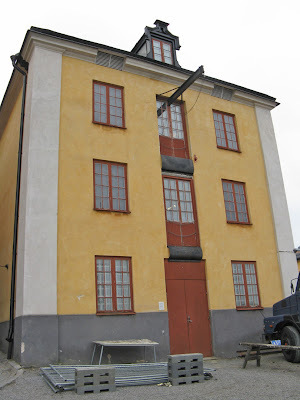 For me, the most interesting of the above ship-making buildings is the rope-twisting building, or the Ropewalk (map 4). Because the ropes were so long, this building is incredibly elongated and occupies almost the entire high ridge of the island (and is nearly half the length of the island). The Ropewalk was later used as an arsenal; this is probably the period when the solid iron shutters were added to the windows. From Gamla Stan, you get a true sense of just how long the Ropewalk is. It continues behind the church for quite a ways. Skeppsholmen’s role as Sweden’s major naval base was limited. During the war with the Danes, the Swedish fleet had been trapped in the Stockholm harbor for four years while the Danes occupied the few routes through the archipelago to the Baltic Sea. In order to ensure that the fleet would have immediate access to open water, it was moved to the newly founded town of Karlskrona in 1680. The buildings related to shipbuilding were leased or sold to private ship consortiums, but the admiralty buildings continued to house naval administration. After the fleet left the island, the drawbridge was replaced with a fixed bridge although it continued to be guarded. In the late 1600’s, King Karl XII moved his personal guards to Stockholm (I’m not sure why they weren’t stationed near his castle already). The King commissioned Nicodemus Tessin the Younger to design barracks for these soldiers who had distinguished themselves in battle and were thus given the prestigious promotion of protecting the king. The resulting Long Row from 1699 forms another dominant axis through the island (map 5). To the south of the two identical, long, three-story buildings were vegetable gardens which are still in evidence today as flower gardens. 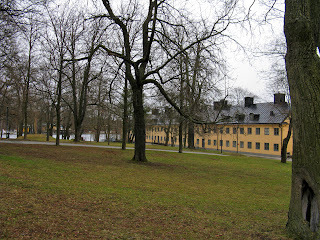 By the time these barracks were completed, Sweden was at war again and the guards were needed elsewhere. Throughout the centuries, these buildings were used as naval offices, storerooms, and courtrooms. Now, the buildings house private residences and a boutique hotel. 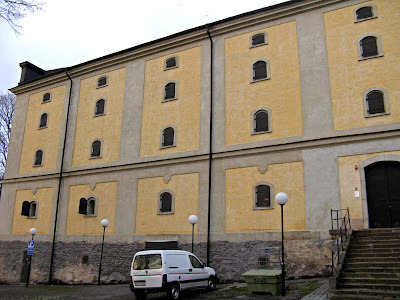 Famines and the plague descended upon Stockholm and Sweden was deep in war with Russia during the early 1700’s; no additional building activity commenced on the island until the 1730’s when city architect Carlberg designed a large grain storage building for the army (map 6). The plasterwork of this building makes it look like a very early example of an industrial concrete-frame-and-infill structure; however, it is likely constructed of brick like most of the other buildings on the island. In the 1750’s, Carl Harleman designed the North and South Inventory Offices, which were originally planned to be one building (map 7). These simple buildings are ornamented only with plaster quoins and hipped roofs which were added during a later renovation. Simplicity and restraint are common traits among many of the military buildings on the island. I really appreciate that although this building was purely utilitarian, it still exudes dignity and worthiness. The pulley lifts goods to the upper floors through doors which extend down to the floor level. In 1756, an army separate from the navy was established in Sweden. While technically separate entities, the army and navy shared administrative space on the island. 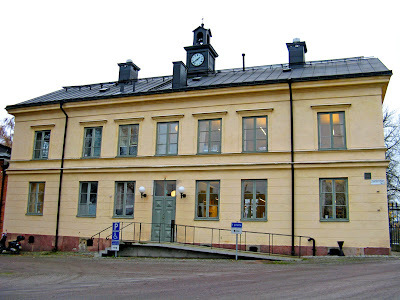 The available office space became inadequate and in 1780 Charles Appelqvist designed the East and West Government Office Buildings (map 8). Like most of the military buildings on the island, the Government Office Buildings are fairly simple with only some simple incisions in the plaster and a watercourse for ornamentation. However, the clock cupolas and the buildings’ position on either side of the only road cutting through the park lend them a more distinguished air than the island’s barracks buildings. During the 1700’s, shipbuilding activity waned on the island and as worksheds were no longer needed, they were removed. In their stead, several officer’s houses with fenced-in yards were built on the south end of the island near the water (map 9). These are now private residences. Only a few of the shipbuilding sheds remain, but some of them are among my favorite buildings on the island. These long brick sheds now house creative functions including a music recording studio and a design firm (map 10). The 1820’s began an energetic construction period for the island. Most notably, Fredrik Blom’s church (Skeppsholmenkyrka) at the highest point of the island replaced a wooden church on Blasieholmen that had burnt in 1822 (map 11). 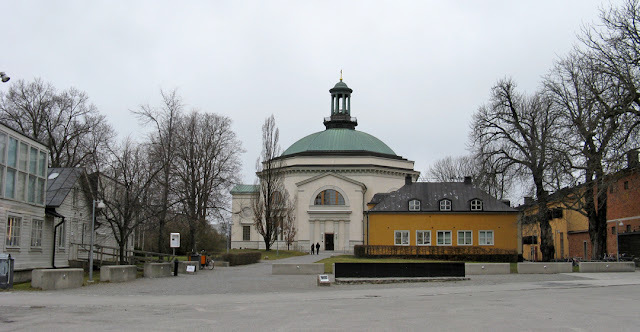 Following Stockholm's post-reformation tradition of centralized-plan churches, this neo-classical church is octagonal and symmetrical in plan and a large dome covers the entire interior. There is little ornamentation on the austere plaster exterior except for barely protruding pilasters, large Palladian windows, some light rustication at the base, and a simple entablature near the top of the octagonal mass. This building gives a very heavy, weighty impression. Services are no longer held in the church but the space is now used for concerts and other cultural events. Because it sits on the island’s highest point, the church is dominant on the island’s skyline from across the water. 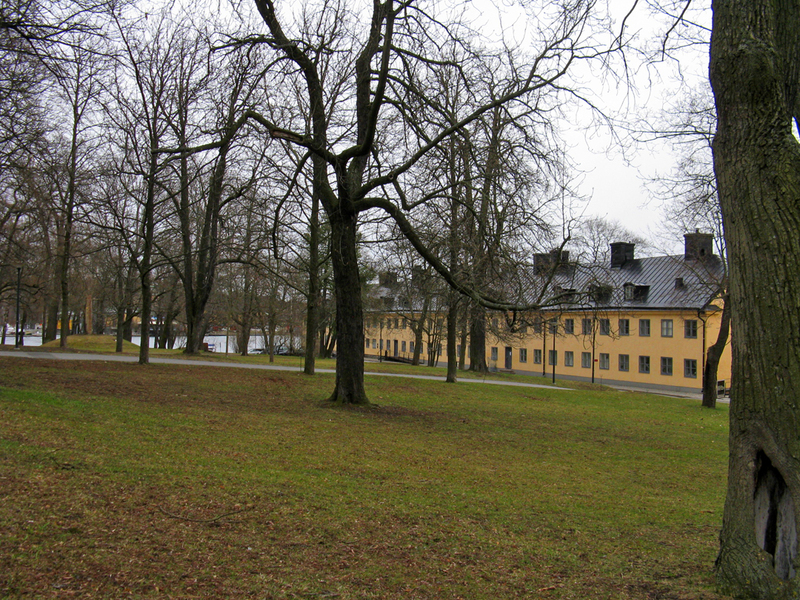 Exercishuset, or The Exercise House, was an important development for military strategy (map 12). The building’s open interior space was meant for sailors to practice their cannon maneuvering drills indoors when the weather didn’t allow such activities outside. Now Sweden’s military would be in peak form for a sea battle even during the coldest months. This simple building was also designed by Fredrik Blom and was built in 1853. 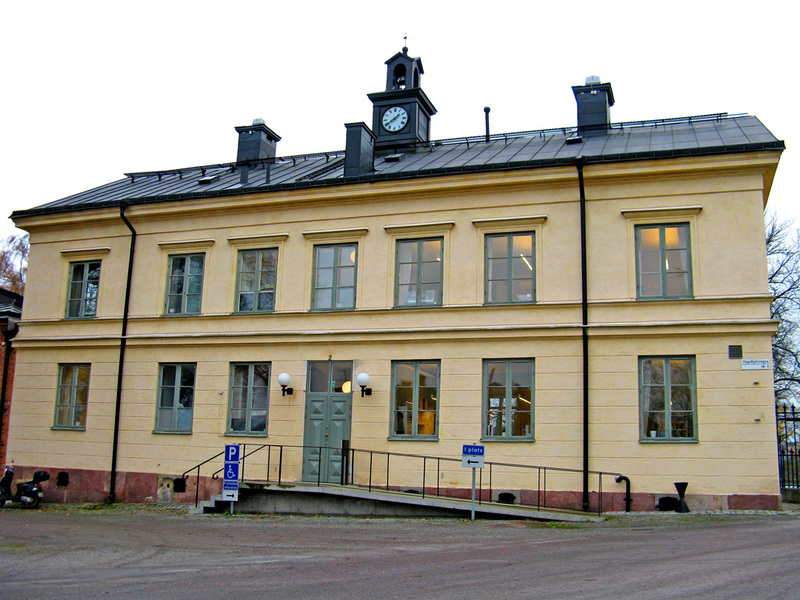 Perhaps the most ornamental building on the island is the Gamla Sjökrigsskolan, or The Old Sea War School, which was built in 1867 and was designed by Axel Fredrik Nyström, Stockholm’s Deputy City Architect. Apparently, the building was considered ostentations and the ornamentation indecorous and not befitting of the stringent military life on the island. The dome was originally used as an observatory for navigation lessons. Sanitation had long been a problem on the granite island (and throughout the rest of Stockholm, too), and much of the building activity of the 1800’s was devoted to improving the disgusting conditions. Amusingly, it became compulsory around 1840 for regiments to bathe in the quayside water. Several new buildings were devoted to bathing—saunas, boiler sheds, pump houses, individual bathing sheds, changing rooms, etc. Even the women of the island were given separate bathing facilities. At some point, these baths were opened to the public and they were quite popular until they were closed in 1923 due to the pollution of the harbor’s water. Once the public gained access to the island in the mid 1800’s and the military’s presence continued to diminish, development proposals abounded. One of the most radical proposals was to blast the granite cliffs (destroying many of the island’s historic buildings) and use the rubble to fill in the land between Blasieholmen and Skeppsholmen. On the new land, 30 six-story apartment buildings would be built. Other proposals called for monumental buildings including the new parliament buildings, a city hall, and a national maritime museum. 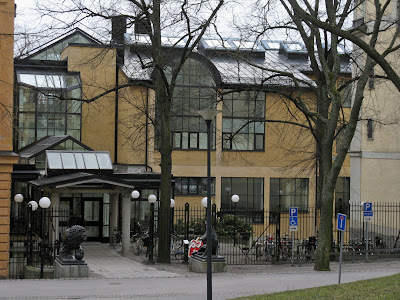 The navy’s superintendent lobbied to avoid development stating that “Skeppsholmen, this real gem with its beautiful houses embedded in the greenery, so dear to all locals, would be sacrificed.” In the end, it was the World Wars that aborted all development proposals. During the World Wars, military activity on the island increased again and several new buildings were built including cannon and torpedo manufacturing and storage facilities. 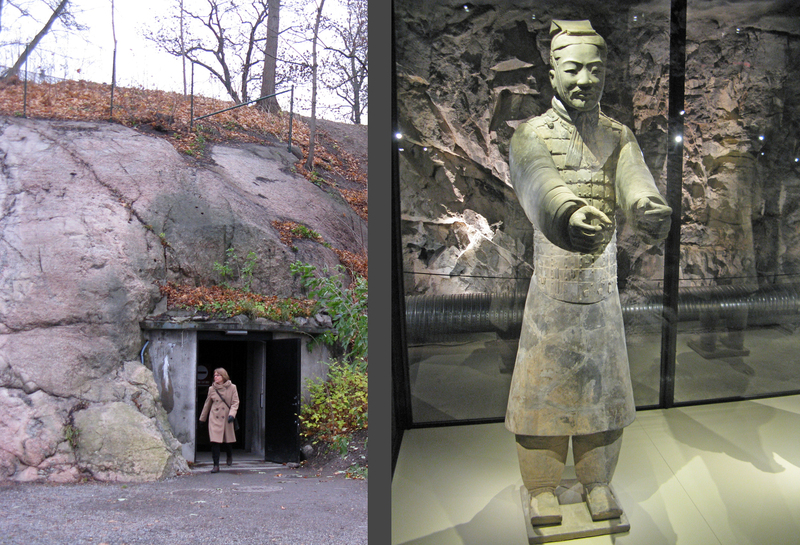 Tunnels were bored into the granite to provide safe command centers. However, such strategic entities were moved out of the city in the 1950's as World War II proved that they were particularly vulnerable to attack. In 1953, Parliament officially closed Skeppsholmen as a naval and army base and transferred the building stock to the national Building Board. 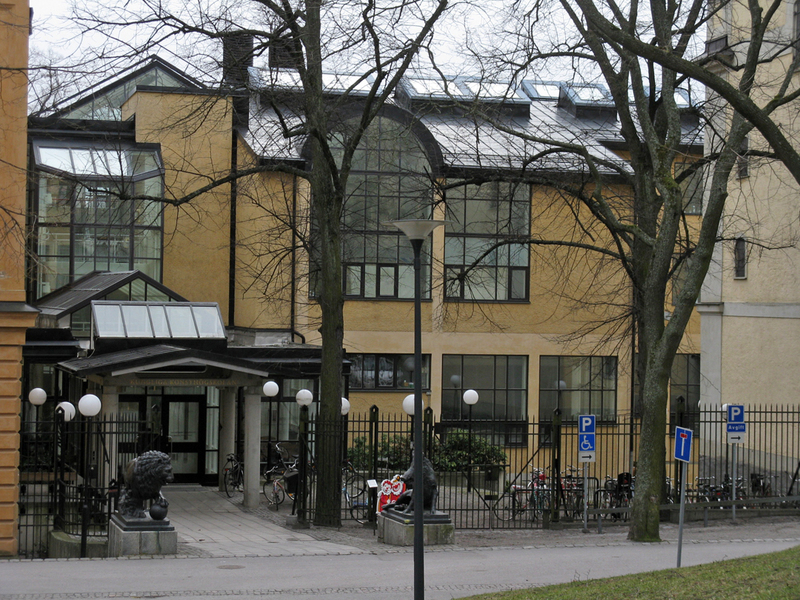 The island was gradually converted to public, cultural uses as the Academy of Fine Arts moved into several buildings (map 13). It is easy to identify the art school on the island—just look for all the large glazed surfaces and north-facing skylights. The Museum of Modern Art was also moved to the island, and it now occupies several historic structures in addition to Moneo’s 1998 building (map 14) (I have posted a review of this building on my Contemporary Projects page). The Ropewalk was converted into an East Asian museum, and the tunnels are now used for internationally acclaimed traveling exhibits. The entrance and inside the tunnels. A few years ago we saw an intriguing exhibit of the thousands of life-sized clay warriors that were buried with a Chinese emperor. The tunnels are ideal for sensitive and valuable collections—they have very few openings, making security straightforward; no natural light penetrates the spaces; and temperature and humidity is relatively constant and easy to maintain throughout the year. Skeppsholmen and its cultural buildings are now part of Sweden’s National Urban Park, the first urban national park in the world. I’ll have to write on this topic once I move into the 20th century. Before the 1700’s, the island was mostly barren rock with very little vegetation. The only exception to this was at the flatter, southern edge of the island. But in 1725, the navy started to spread soil over the granite outcroppings and to plant trees. During naval expeditions in the archipelago, crews exhumed full-grown trees, shipped them to Skeppsholmen, and planted them throughout the island. Additionally, they created a green park (map 15) lined with trees behind the Long Row. Why the navy had the sudden urge to landscape and beautify the island I don’t know, but it seems that there was a general surge in interest in vegetation in Stockholm at that time because individual trees began to be noted on maps. These images from 1852 and 1870 show that with the exception of the over-scaled Moderna Museet, the island hasn’t changed much since the 19th century. Note how individual trees are drawn on the later map. Further attention was lavished on the island’s landscape in 1865 when A. J. Ericsson drew a comprehensive landscape plan for the island. The proposal included artful plantings, trees, allées, lawns, and winding paths, all ideals of the 19th century romantic landscape park. Much of his proposal was realized. 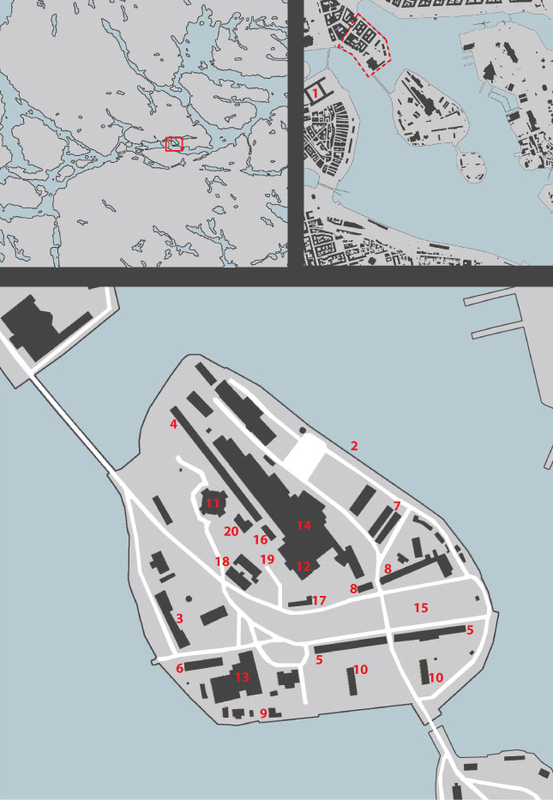 Looking at a map of the island, it is obvious that Skeppsholmen was never subjected to Örnehufvud’s rigorous planning. The island was always set apart from the city: during Örnehufvud’s time, the island was a royal pleasure garden and was thus un-developable and later, when it became a shipyard and naval base, the island remained inaccessible to the regular citizen. Buildings related to ship construction lie about helter-skelter, placed as was convenient to the trades and to the topography. The Admiralty buildings occupy the center of the island. The placement of these buildings is somewhat more planned, but the island’s topography prevents an absolute, orderly arrangement. Except for the church which occupies the highest point, there is little sense of hierarchy among the military buildings. Bordered by the Ropewalk (map 4), Jail (map 16), and Exercishuset (map 12) to the east, the tavern (map 17) to the south, Skeppsholmenkyrka (map 11) to the north, and a barracks (map 18) to the west, Exercisplan, at the center of the island, is a somewhat formal focal point (map 19). The effectiveness of this focal point is reduced by the skewed barracks building (map 18). The square’s formality was further diminished when a canteen was built between the square and the church in the early 1900’s (map 20). Sadly, Exercisplan is now occupied by a large parking lot and the space’s formal character is now completely lost. 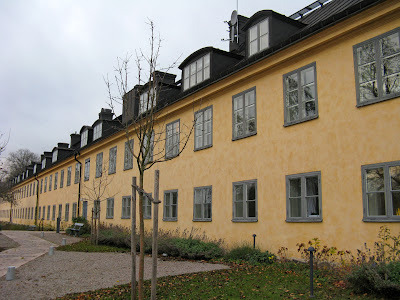 Although the buildings of Skeppsholmen were constructed throughout 250 years, most of them have a consistent, though not identical, appearance with simple classical ornamentation. Nearly all of the military buildings on the island are unified with slightly swirled yellow plaster. However, crenelation was added to several buildings, probably around 1750. The crenelation reinforces the defensive nature of what was housed on the island, but it was added to the buildings long after it served an actual purpose of sheltering guards from arrow attacks. The crenelation is doubly odd considering that the islands’ buildings were never defensive structures but merely housed the defense’s administration. Winter might be the best time to catch a glimpse of Skeppsholmen’s enduring maritime nature. During the summer, the island’s docks are nearly empty while pleasure, house, and tourist boats ply the waters. But in the winter, the docks along the north and east shores are filled with boats, many of them historical wooden sailing ships. I love the mailboxes on the old tie-up for those that live on the island. There’s also a historic rotating crane on the quayside. One disappointing aspect of Skeppsholmen is the prevalence of parking lots throughout the island. Unlike most of Stockholm, just about every building on the island has a sizeable parking lot directly outside its front door. These parking lots detract from the park-like setting and from the historic architecture. If I were in charge, I would remove nearly all the parking on the island, or at least consolidate it into one lot in one location. The sprawling and ubiquitous nature of the current parking situation on Skeppsholmen is a tragedy. I don’t know anything about them, but I’m quite taken by the brickwork and by the scale of these buildings. After being dredged up from the seabed where it had lain since its fateful first voyage, Vasa is now housed in a magnificent museum; I highly recommend a visit. This is the same Queen Kristina who later abdicated the thrown, converted to Catholicism, and moved permanently to Rome. In the 1700’s, this building also housed the lions and tigers that entailed the Bejen of Algiers’s gift to King Frederick I. One of the lions was later preserved by a taxidermist who had never before seen a lion. This document is in Swedish but it contains lots of good historical and architectural information about Skeppsholmen as well as good maps, historical drawings, and photos.